There is something alluring about human emotions, expression and thoughts and for me they form the base of my inspiration. I would like to call my art, ‘Emotive Evokism’. My constant attempt with my works is to present the brilliance of the human mind, the large spectrum of possibilities it is a gateway for. For me these compositions are a sojourn on a path to discovery and deeper understanding. Syed Naqib Ahmed is a celebrated cartoonist. 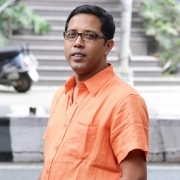 His works were featured in Bangalore Times in the early 2000s. He currently works as an Art Director. His works encompasses subtle use of solid striking colours that rise with a liberal life characterization. They are often thought provoking and carry a sense of urban satire. He mainly works in the digital art media to give a new and different aspect to his work.